"I feel fortunate for this opportunity to bring you my own music. During the recording process, I envisioned it being two guys in a canoe in the year 1740 or a Paris fashion show or an ice skating routine or mountain climbing or driving a vehicle or being part of that special moment. I hope The Sea To The North makes you feel good and takes you somewhere you've never been before -- somewhere you will want to return to often. 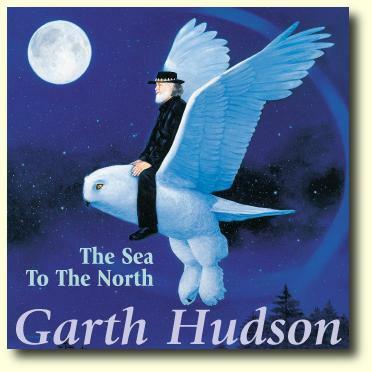 Happy trails..."
The US pressing of Garth Hudson's first solo album (if you don't count 1980's Our Lady Queen of the Angels,) is available for purchase from Woodstock Records. The Sea to The North has also been released in Canada, Japan and Europe. For more about this wonderful album, see the reviews by Peter Viney and John Donabie.